England produced a golden start to the final day of competition on the track at the Gold Coast Commonwealth Games, with both the men’s and women’s 4x100m relay teams finishing top of the podium. The men’s line-up of Reuben Arthur, Zharnel Hughes, Richard Kilty and Harry Aikines Aryeetey – unchanged from the heats – crossed the line first in 38.13, ahead of South Africa’s national record of 38.24 and Jamaica’s third-place finish of 38.35. Australia were narrowly behind in 38.58. The England women’s team had a somewhat unfamiliar look to it. Asha Philip, Dina Asher-Smith and Bianca Williams are all names accustomed to being at the heart of relay competition. Lorraine Ugen, however, is more used to the long jump runway but she was drafted in at short notice to run the anchor leg following a slight injury to Corrine Humphreys following her earlier 100m action. 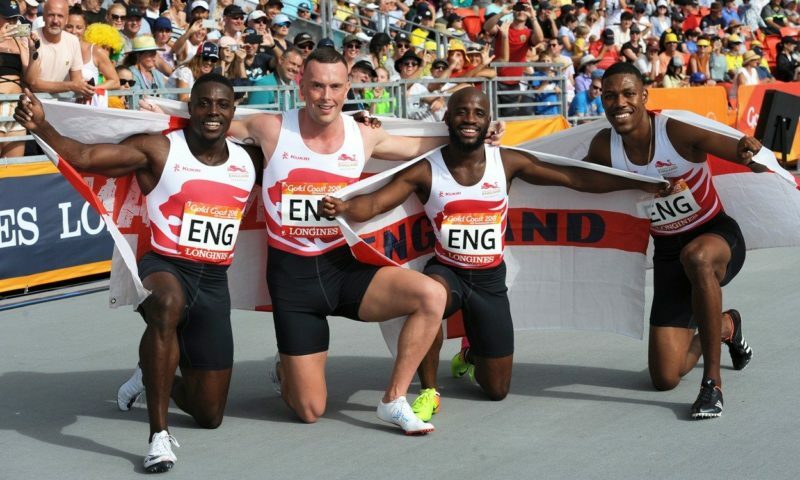 The reshuffle certainly didn’t slow England down, however, as the quartet produced a national record of 42.46, ahead of Jamaica’s 42.52 and Nigeria’s 42.75. Ugen had the small matter of trying to hold off Jamaican superstar Elaine Thompson but she managed to do just that – not bad for a full-time long jumper who couldn’t quite remember the last time she took part in a relay event. So when did she last compete in a sprint relay? “When I was at university was probably the last time I did it, so a few years ago!” she added.